After 14 years of loyal service to Yes Response, Maureen Claypole, a mailing operative, has decided to retire. 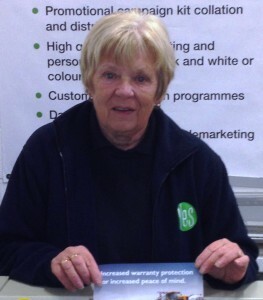 Having processed millions of mailing packs and promotional kit collations, Maureen has earned her right to a long, healthy and happy retirement with her husband Graham. A leaving presentation and luncheon for all Yes Response personnel was held at The Bull’s Head, Repton. Demand for goods ordered online but collected in stores could soon be growing at a faster rate than home delivery ordering, as consumers embrace so-called “click and collect” services. According to figures from strategy consultants OC&C, the volume of UK non-food sales made via the internet for collection in store, will increase by 33m parcels this year, compared with 2013, on a par with the increase in units for home delivery at 36m. OC&C forecasts that in 2015, growth in the volume of units ordered online but collected in store will overtake that for home delivery for the first time, increasing by 53m parcels, year on year, compared with a rise of 38m parcels for home delivery. “Click and collect is the biggest growth channel potentially now, (growing) faster even than home delivery,” said Michael Jary, a partner at OC&C. Non-food click and collect remains small. OC&C puts it at 11 per cent of the UK market by volume this year, but forecasts that it will reach 30 per cent of the market by 2017, equivalent to compound annual growth of 60 per cent between 2012 and 2017 compared with just 5 per cent for home delivery. Britain leads the way in both food and non-food click and collect, although the channel is growing quickly on both sides of the Atlantic. For consumers, it can be more convenient than waiting at home for a delivery. For retailers, the model can improve the economics of selling via the internet, particularly in grocery, where with online shopping the store is forced to do much of the work traditionally carried out by the shopper. UK IS STILL ONE OF THE CHEAPEST COUNTRIES TO SEND A LETTER! Despite the largest proportional price rises over the past three years, the UK is still one of the cheapest countries in which to send a standard sized domestic letter. It costs 60p to send a First Class standard sized letter in the UK, the same price as in China. Among our European comparators, it is only cheaper to send a letter with the same dimensions in Ireland (49p) and Poland (46p). These were amongst the findings of Ofcom’s International Communications Market Report, which examines take-up, availability, price and use of communications services across the world’s major countries. The report also reveals that a higher proportion of online UK adults send invitations, greeting cards or postcards in comparison to other countries surveyed.